Drupal 6 has been out for a while now and modules are getting ported to the new version. For those of us that are relatively new to Drupal it has been a long slow wait – but the benefit is that we have a bit of extra motivation to learn and do “stuff” for ourselves. Feed Aggreagtor is supplied in D6 and is pretty self explanatory. The remaining 3 are very powerful. I checked out the really cool myplay.com site Sony-BMG put together. If you haven’t seen it you should check it out. 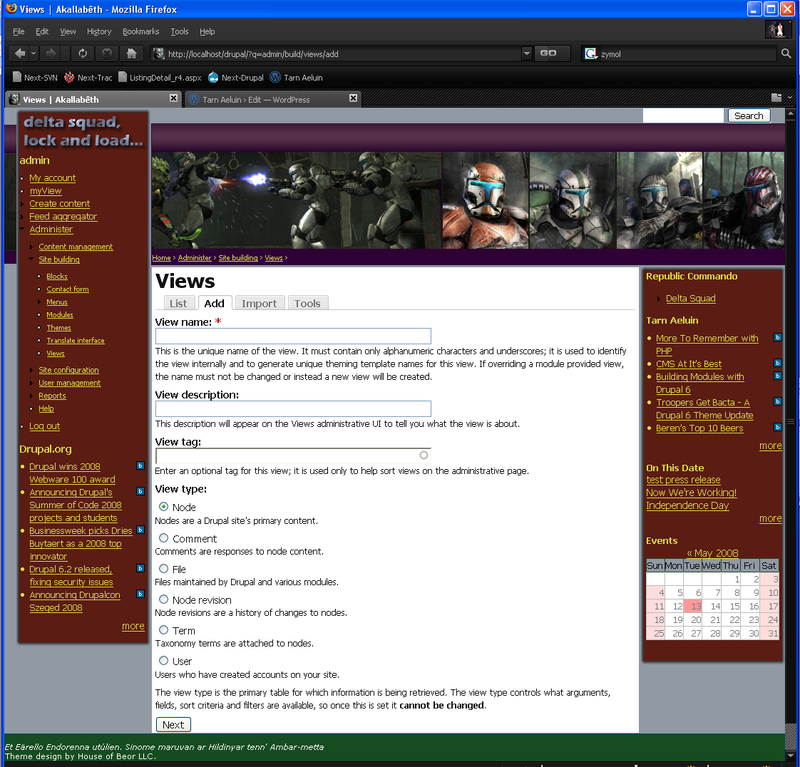 They made extensive use of Views and Panels to build this site. Views is in beta now for D6 and since I also wanted a calendar, I decided to start experimenting with Views. Ok – to explain that comment: the best Calendar function for D6 uses Views for the rendering of the event data. Because Views are still in beta I had to do some tweaking. There are a bunch of overviews and tutorials for the original Views modules on drupal.org – so start there if you want an overview. What you’ll find however is that once you get past the “what is a view?” type stuff they aren’t much help. In short a View is a list of “stuff”. 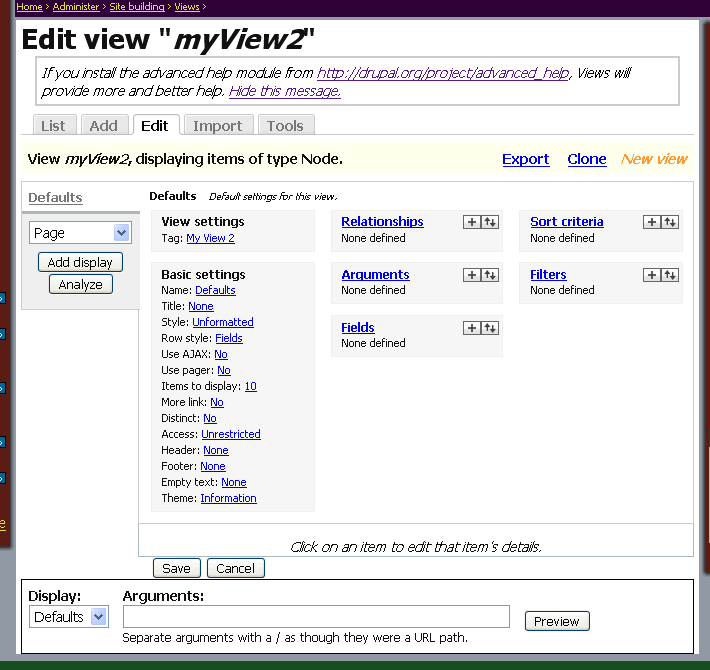 The list is defined in the Views administration area through a GUI interface. The list is generated by defining a query against your database – you add attributes to extract; arguments to select what to return; sorting criteria, etc. You can then select how to display the list: a node, a block, as a feed, etc. Pretty cool I think. How do you create one? That’s what I’ll cover. To get started I’m working with the very latest Drupal code (6.2 at time of writing). 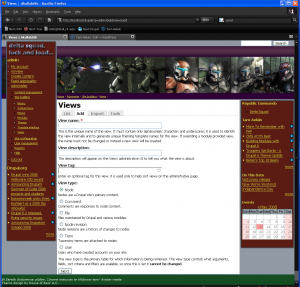 I have a pretty basic config – but its completely to do date as of 3-May-2008. I’ve installed Views (6.x-2.0-beta2) and I’ve also installed the Advanced Help module (advanced_help-6.x-1.0-beta2). This is the main spot where you create your view. Go ahead and bang in some values and make sure you pick off the “node” choice. What we’re going to do is create a simple “node” type view that will look like a page. We can create a link in the Navigation menu for this afterwards. Once you fill in some values then hit add and you’ll get this next screen. It looks pretty complicated, but just remember all you’re doing is defining a query. As you move through the various items in the menu you can easily build some really cool output. The relationships block is used to define keys between fields. 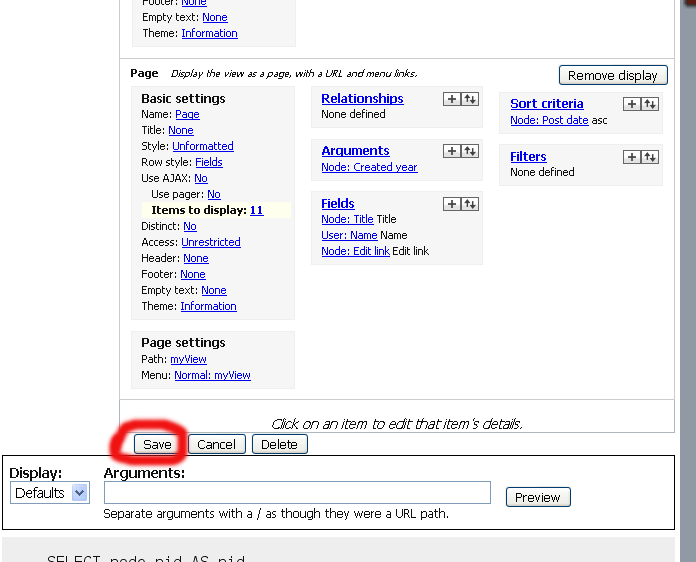 Arguments can be used to filter data based on a parameter, for example s returning records based on a date limiter. After you get done playing around with the data you need to select a display view for your query results. There are several options, but for this example I’ve selected the page display mode. What this will be is create a view of the output in a “page” – gee imagine that. The output will display in the main content area. When doing this make sure to watch the button carefully as they are AJAX and change quickly. If you click something and you think nothing has happened, be sure to scroll down and look at the output. Once you get done screwing around with your view you can then add it to a menu – for the page type just use the page settings. I added mine to my main menu. Experiment with the other display types. That’s pretty much it. If you start to experiment with Views you can really learn to do some very interesting things. This is especially true for very active group/team sites where a lot of people are contributing content. One interesting things I’ve done with Views is assemble sorted “update” pages that show the latest contributions sorted by dates, or by users. This is a great way to keep up to date on what your teamates are doing. excellent article. Thanks a million Ive been trying to get my head around views. Sure there is…they are not yet full stable releases, but the development releases have been available for quite some time – I think they first came out in September 2008. I think at the time I wrote this Panels for d6 was still not very stable and thus I never actually show how to use it in the article. Today panels are working pretty well on d6. I’m not getting rid over this view 2. I have few node types says “a”,”b”,”c”… etc…Each of these uses own theme. Now I want to list out news corresponding to each “node types”. So I think, i could achieve this by use of View.But I’m not sure whether I should use view or not? And how can I theme o/p of view? 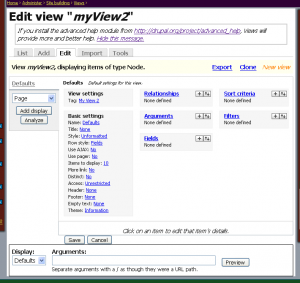 Views is not Drupal’s core module – you have to download it and install it manually! 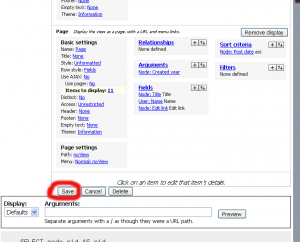 Arguments are values that will narrow the query return. In my example “created year” is an argument that will make the query only return records for a given year. Hope that helps. Thanks, seems like I’m gonna have to explore this issue a little deeper before I start using arguments. How to upgrade views version to new version? What version? The very latest?